Is Palladium about to Expose the LBMA Fraud? The realization that holding certificates is in fact holding nothing is first starting to be understood in the palladium market because of a shortage of above-ground supplies, which, unlike gold, are used primarily in the auto industry. Supplies are now being constrained by Russia’s holding back supplies, no doubt related in part to growing geopolitical tensions, and no doubt they prefer trading it with their “friendly” Chinese automakers. In any event, companies that take out contracts thinking they can get delivery but then are unable to do so may want to secure a source of the metal to ensure they can stay in business, because without palladium, auto manufacturers won’t be able to produce cars. Sure, in time, platinum may well substitute for palladium, and into the future, electric cars may render catalytic converters obsolete. But for now, automakers have to have palladium and prices have to rise to much higher levels before it begins to impact the cost of an automobile in any meaningful way. One of the few nearly pure palladium deposits in North America is the Lac des Iles Mine in Ontario owned by North American Palladium (NAP). I added this story to my letter on Nov. 23, 2018, at $8.69. It closed this week at $10.37. Approximately 90% of the stock is owned by a hedge fund and there are only 51 million shares outstanding, so there isn’t a lot of stock outstanding. That’s why I had to pay up to US$10.03 to get my order filled about a month ago. But under a new management team that took over since NAP was rescued from bankruptcy a couple of years ago, the company is swimming in cash flow now. 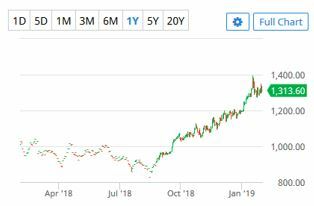 One risk I thought of when I bought this stock was that the hedge fund might simply look to make a quick buck and sell it into a strong palladium market. But given the company’s commitment to building reserves, that doesn’t seem to be its intention. It has the management to operate this project and expand it to make it even more valuable over time. It strikes me as an asset that one or several major automakers in North America or elsewhere outside of the few countries that have strong relations with Russia might want to own. As you can see from my personal portfolio allocation above, NAP occupies nearly 5% of my portfolio. I’m pleased about owning this stock at least for now. But the bigger issue is what David pointed out in an article he wrote in June 2017. With Russia now withholding palladium from the markets, the stockpiles have been drawn down massively and panic buying is taking place. But what David is getting at is the notion that, given the shortage of physical metal to meet this urgent demand, the Achilles’ heel of the world’s predominant price setting center for precious metals (gold, silver, platinum, and palladium) in London is being exposed. David explained that he is talking about “the London Bullion Market Association (LBMA) designed by the Bank of England.” The con game is to substitute trading and holding metal itself—the historically reliable price discovery method—with unallocated (unbacked) precious metals spot contracts. Unallocated spot contracts (for immediate ownership of metal) are effective in suppressing metal prices if investment funds and banks can be convinced that the contract claims, that can be created without limit, are a substitute for metal itself. The LBMA currently trades ownership of more than 200M oz of gold each day (more than 2x global annual mine production) in the form of unallocated spot metal contracts with an estimated 400M to 600M oz of unallocated claims for gold standing in the London market. David believes the light is being shined on this con game orchestrated by the Bank of England by the palladium markets that are providing evidence that owning a paper contract to buy precious metals is not the same as actually owning the physical metal. Sure, there is plenty of above-ground gold in the world that the game can carry on a long time, as long as people remain confident in the paper money system. I should point out that at least one news item this week may also be calling into question the dependability of the Bank of England, who is behind the fraudulent LBMA and that was when it agreed to obey U.S. demands that gold held on behalf of the government of Venezuela would not be shipped to that country’s president, Nicolás Maduro. Most certainly, countries will not be able to trust the Bank of England any longer with storing gold in the Bank of England. For more information on the LBMA you may want to go here: the London Bullion Market Association’s (LBMA) design by the Bank of England.